From ChartsBin.com, viewed 21st July, 2011, <http://chartsbin.com/view/nz2>. Despite the country’s positive economic performance after the global financial crisis, it slipped in its ranking in the 2011 Index of Economic Freedom released by Washington-based think tank the Heritage Foundation Inc. The Philippines is now ranked the 115th “freest economy” out of 183 economies worldwide; it is also the 21st freest economy in Asia, a region with 41 countries. The Philippines gained one point to score 24 in freedom from corruption. While there are efforts to improve the anticorruption drive under the new administration, the country still had a “long-standing” culture of corruption. The think tank said corruption in the country is “perceived as pervasive” because efforts to curb it have been inconsistent and the reforms have been overshadowed by high-profile corruption cases reported in the media. “President Benigno Aquino III took office in 2010 with a mandate to address rampant government corruption. The previous government’s failure to do anything substantial to liberalize the economy set back efforts to attract much-needed foreign investment in basic industries and infrastructure, and the Philippines has continued its long slide from being one of Asia’s richest economies to being one of its poorest,” the think tank said. Corruption is perceived as pervasive. The Philippines ranks 139th out of 180 countries in Transparency International’s Corruption Perceptions Index for 2009. A culture of corruption is long-standing. The government has worked to reinvigorate its anti-corruption drive, but these efforts have been inconsistent. Reforms have not improved public perception and are overshadowed by high-profile cases frequently reported in the Philippine media. The Philippines ranked 56th among 66 countries included in...study in providing access to justice to its citizens based on the Rule of Law Index 2011, which attempted to measure the rule of law around the world...The Philippines’ civil court system also got poor scores (ranking 12th out of 13 in the region and 56th globally) because of deficient enforcement mechanisms, corruption among judges and law enforcement officers, and the lengthy duration of cases. "These factors may explain why few people use the court system to solve disputes,” the report said. The Philippines performs well relative to lowermiddle income countries on most dimensions, although it still requires further efforts in many areas. The country stands out for having reasonably effective checks and balances on the government’s power (ranking 3rd out of 16 income-group peers), including a vibrant civil society, a free media, and an independent judiciary. The Philippines also outperforms most lower-middle income countries in the area of effective regulatory enforcement, ranking 4th out of 16 countries. Nonetheless, civil conflict and political violence remain significant challenges (ranking 56th). Of particular concern are shortcomings in the field of fundamental rights (ranking 40th), particularly in regard to violations against the right to life and security of the person (ranking 57th); police abuses; due process violations; and harsh conditions in correctional facilities; as well as deficiencies in the electoral process. The civil court system also obtains poor scores (ranking 12th out of 13 in the region and 56th globally), attributable to deficient enforcement mechanisms, corruption among judges and law enforcement officers, and the lengthy duration of cases. These factors may explain why few people use the court system to solve disputes. According to a general population poll of 1,000 people in Manila, Davao, and Cebu, only 5 percent of the people who had a debt collection dispute went to court. Out of those people, nobody had the conflict resolved in less than a year. 1. How has corruption level changed in past 3 years? 2. How are these institutions affected by corruption? 3. How do you assess the government's fight against corruption? (surveyed mid-2010). CORRUPTION apparently has lessened among select Philippine institutions but overall worsened in the country over the last three years, results of a global survey conducted by watchdog Transparency International (TI) showed yesterday. the judiciary, 3.1 from 3.4. Media’s score stayed unchanged at 2.0. For the 2010 report five other institutions were added, with Filipinos rating corruption in the police at 3.6, nongovernmental organizations at 2.4, religious bodies at 1.9, military at 2.9 and the education system at 2.7. Based on their scores, police and political parties are viewed as the most corrupt, with religious bodies enjoying the most favorable perception. Only 6 percent said that corruption in the Philippines decreased and 25 percent said that it stayed the same. The survey said that the most corrupt in the country were political parties, 3.6 percent; police, 3.6 percent; parliament/legislature, 3.5 percent; public officials, 3.5 percent; judiciary, 3.1 percent; military, 2.9 percent; business/private sector, 2.9 percent; education system, 2.7 percent; and nongovernment agencies, 2.4 percent. The least corrupt were media, 2 percent and religious bodies, 1.9 percent. The World Bank concluded on December 8 the first meeting of the International Corruption Hunters Alliance. Corruption fighters from around the globe gathered at the World Bank in Washington, DC, to up the ante on fraud in development projects – part of an effort to halt practices that cause $20-40 billion to be stolen each year from developing countries. In the first meeting of its kind, more than 200 members of the International Corruption Hunters Alliance from 134 countries created an international enforcement regime to track and resolve bribery and fraud cases that reach beyond borders to affect more than one country. “President Aquino is serious with our reforms. He is aware that the battle against corruption is crucial to our efforts to attract and compete for more investments,” she said. “Transnational corruption is a menace that we can defeat only if we get our acts together,” she said. “We need to be individually responsible for the culture that allows corruption to fester in our respective countries. But we must also take responsibility for the participation of our respective business organizations in acts of corruption that take place in foreign shores,” she said. De Lima called for a more systematic and aggressive exchange of information among governments in the investigation and prosecution of parties involved in transnational corruption. She said investments from the multinational sector and assistance from global financial institutions play an important role in the socio-economic development of the Philippines. “And I see a future when those development resources are utilized in our country in a regime of transparency and integrity,” she said. “Implementing the resolutions we made this week will take effort, money, results and perseverance. We are not intimidated by that,” said Leonard McCarthy, World Bank Integrity Vice President in his concluding address to 247 anticorruption officials from 134 countries who gathered in Washington for their first meeting. The newly-formed Alliance left the Washington meeting with a commitment for stronger action on enforcement, transnational bribery crimes, measuring results and information sharing. CHRISTIAN SCIENCE MONITOR 3/28/11 >>> High profile scandals in China, India, and the Philippines: What's going on? Transparency International’s Global Corruption Barometer is the only worldwide public opinion survey on views and experiences of corruption. As a poll of the general public, it provides an indicator of how corruption is viewed at national level and how efforts to curb corruption around the world are assessed on the ground. It also provides a measure of people’s experience of corruption in the past year. The 2010 Barometer, the seventh edition, reflects the responses of 91,781 people in 86 countries, and offers the greatest country coverage to date. Sadly, few people trust their governments or politicians. Eight out of 10 say political parties are corrupt or extremely corrupt, while half the people questioned say their government's action to stop corruption is ineffective. "The message from the 2010 Barometer is that corruption is insidious. It makes people lose faith." Similar dips for Cambodia (9.27 from 8.30) and Indonesia (9.25 from 9.07), however, allowed the Philippines to stay in third place. Seen as the least corrupt was Singapore with a score of 0.37, followed by Hong Kong (1.10) and Australia (1.39). The Asian average, which excludes the grades of Australia and the United States, worsened to 6.08 from 5.90 in 2011. Faring little better after the Philippines were India (8.67), Vietnam (8.30), China (7.93) and Thailand (7.55). Rounding out the list with scores superior to the regional average were South Korea (5.90), Malaysia (5.70), Taiwan (5.65), Macau (4.68), the US (2.39) and Japan (1.90). PERC, which polled respondents on their views on political, institutional and private sector corruption, said the magnitude of the Philippines’ problem was "definitely not so large that it has many cross-border implications". Corruption, however, was said to have taken a large toll. This latest survey -- conducted from November 2010 to February 2011 -- covered 1,725 middle and senior expatriate business executives working in Asia, the US and Australia. The expatriates were asked to provide scores only for the country where they were working and their country of origin. Sought for comment, a Palace official said the Philippines had at least maintained gains against corruption. 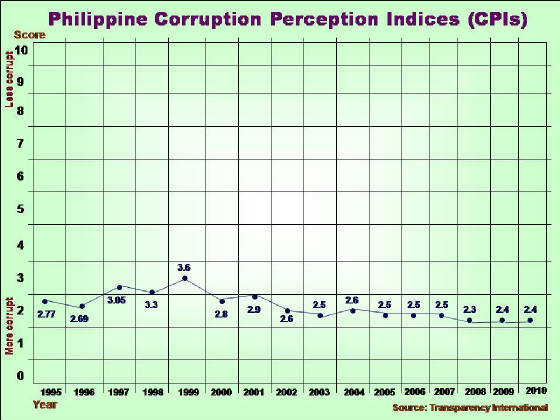 "The ranking of the Philippines shows that we have maintained the improvement from the time in 2007-2008 when we were ranked as the most corrupt in our region," Undersecretary Manuel L. Quezon III of the Presidential Communications Development and Strategic Planning Office said. As for the military being perceived most corrupt, he blamed recent highly-publicized Congress probes. "[It] shows that the expat business community has attentively been following the investigations...," Mr. Quezon said. He gave assurances that the government would continue working to eradicate corruption. "This (the PERC survey) can be a tool and it will be taken seriously... it shows us that we have to recover that sense of optimism," Mr. Quezon said. The country scored 56.2 in the 2011 Index of Economic Freedom, 0.1 down from last year and in the range classified as "mostly unfree." It was ranked 115th out of 179 economies, down from 109th in 2010. 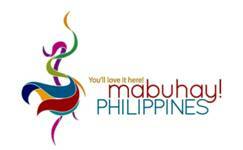 Regionally, the Philippines ranked 21st out of 41 Asia-Pacific countries. The index -- a project of The Heritage Foundation and The Wall Street Journal -- ranks countries on a 1-100 scale measuring 10 areas: business, trade, fiscal, state spending, monetary, investment, financial, property rights, freedom from corruption and labor. Scores ranging from zero to 49.9 are classified as repressed; 50-59.9, mostly unfree; 60-69.9, moderately free; 70-79.9, mostly free; and 80-100, free. Hong Kong (89.7) and Singapore (87.2) remained in first and second place, respectively, for the 17th straight year. At the bottom was North Korea with a score of 1.0. The global average was placed at 59.7. The 2011 report noted a "notable recovery" for the Philippine economy since mid-2009, due mainly to strong exports. "The absence of entrepreneurial dynamism, however, still makes long-term economic development a difficult task," it said. Reforms to develop the entrepreneurial environment and the private sector were noted but progress was said to be mixed. "Deeper institutional reforms are required in four interrelated areas: business freedom, investment freedom, property rights and freedom from corruption," the report said. "The government imposes formal and non-formal barriers to foreign investment, and foreign remittances do little to promote sustainable growth. The judicial system remains weak and vulnerable to political influence and corruption," it added. In terms of business freedom, the country scored 43.4, down 4.7 points from last year and well below the average of 64.3. The report said potential entrepreneurs "face severe challenges," calling the overall regulatory framework "burdensome" and the legal framework "ineffective." The trade freedom score, meanwhile, was unchanged at 77.8 and better than the average of 74.8. The report said 15 points had been deducted from the Philippines’ score to account for non-tariff barriers. The fiscal freedom score was also unchanged at 78.8, also higher than the average of 76.3. The country’s "relatively high tax rates" were noted. The government spending score fell 0.2 to 91 but was above the average of 63.9. Total state expenditures were said to have held steady at 17.3% of GDP. Monetary freedom was scored 76.3, up 3.6 points and better than the 73.4 average. The report noted moderate inflation and the infrequent exercise of controls, but also said 10 points had been deducted for "measures that distort domestic prices." The investment freedom score was unchanged at 40, below the average of 50.2, and the report cited restrictions on foreigners taking stakes in a number of economic sectors. The financial freedom score was also unchanged at 50, above the average of 48.5. The local financial system was cited as welcoming foreign competition and improvements in capital standards and oversight were noted, as well as gains in consolidation and non-performing loans. The property rights score also stayed at 30, below the average of 43.6, and the report noted that "delays and uncertainty associated with a cumbersome court system continue to concern investors". Organized crime was described as a "serious problem" and intellectual property rights enforcement -- despite some gains -- "remains problematic." The country’s freedom from corruption score rose a point to 24 but stayed well below the average of 40.5. "A culture of corruption is long-standing," the report said. Transparency and Accountability Network Executive Director Vincent T. Lazatin, for his part, said a number of measures still had to be implemented by the government. For decades, Australia's aid officials have wrestled with the challenge of how to have an impact on poverty while minimising our corruption losses... In the decade from 1996, spending on governance programs such as better administration went from 9% of the aid budget to 30%. In Papua New Guinea, where around half our aid goes to consultants and training programs, there have certainly been some success stories. Yet a recent AusAID review pointed out that PNG still ranks highly for corruption, and suggested that the number of expensive expatriates should be cut back... internationally, the construction sector has a reputation for being one of the most corrupt sectors. Because each construction project is subtly different, modifications invariably need to be negotiated as the project is built. The consequence...is that 'a large public investment program is dependent upon a sector which is globally corrupt'... if donor countries like Australia were to run a risk-averse aid program, it would involve building fewer roads in places like in Indonesia and the Philippines. According to the latest figures, AusAID's losses to fraud in 2009-10 were just 0.028% per cent of the total aid program. This is minimal by comparison with other government departments (Centrelink's proportional loss to fraud is considerably higher). Indeed, it's probably lower than fraud losses for businesses operating in Australia, and doubtless much smaller than losses suffered by Australian companies investing in developing nations. Yet in a world where many good aid programs go unnoticed, while fraud losses are splashed across the front page, the incentive is to be overly risk-averse. According to a 2009 Australian National Audit Office report: 'AusAID's cautious approach to fund provision, while minimising the risk of corruption, has sometimes prevented resources to getting where they are most needed'. It is not in Australia's interests for our aid program to ignore the countries most in need (our top nine aid recipients score in the bottom half of Transparency International's corruption ranking). Nor should we return to the old approach of overspending on technical assistance at the expense of schools, health clinics and roads. MANILA, Philippines – The Asian Development Bank (ADB) stepped up its fight against corruption in 2010 with the introduction of new initiatives, including the revised integrity guidelines and a cross debarment agreement signed with development partners. The 2010 annual report issued by ADB's Anti-corruption and Integrity office has highlighted the bank's support for developing member countries, with fraud and corruption detection training given to government agencies in several of ADB's developing member countries. Five procurement-related reviews were also carried out around the region to verify that ADB financing was being used for the intended purposes. The report notes that since the signing of the cross debarment agreement in April 2010, ADB has notified partner development banks of sanctions imposed on four firms and 10 individuals found to have breached anticorruption policies. In turn, ADB cross-debarred six firms and two individuals sanctioned by the World Bank. A new, secure internet portal was also set up last year to give government officials of ADB's developing member countries access to ADB's full list of sanctioned groups and individuals. In 2010, ADB introduced comprehensive whistleblower and witness protection procedures to protect staff and to some extent third parties who report instances of suspected fraud and corruption in ADB projects. A mandatory staff training course on anticorruption was also introduced concurrently. "These are serious steps we have taken to help reduce fraud, raise awareness about potential irregularities in project implementation, and to increase understanding of ADB's anticorruption efforts," said Peter E. Pedersen, Head of ADB's Office of Anticorruption and Integrity. With the implementation of the cross debarment agreement, the total number of debarments issued by ADB is expected to rise this year. In 2010, ADB's Office of Anti-Corruption and Integrity received 188 new complaints, with 99 of them turned into full investigations. Thirty-seven firms and 47 individuals were sanctioned by ADB in 2010. Since 1998, ADB has sanctioned 376 firms and 380 individuals. With improved investigative methods, case management, and review processes, the time taken to complete investigations is expected to be reduced in future, the report says. In 2011, the office expects to continue anti-corruption training assistance in at least two countries, to carry out more project procurement reviews, and to scale up ADB staff training with the introduction of online anticorruption courses.